More than 100 million people around the world log in to Twitter every day to tweet about everything from their daily commutes to the meals they eat -- but many have used the social networking tool this year for something much more important: share important events with people who could be thousands of miles away. Every year, Twitter compiles a year-in-review to recap what the company believes were the most important tweets. They highlight the "best" according to the level of "impact, resonance, and relevance," and take into account the big stories that first broke on Twitter -- not by news agencies -- but by people looking to share a photo, a thought, or a moment in time with people they may never meet. 1. 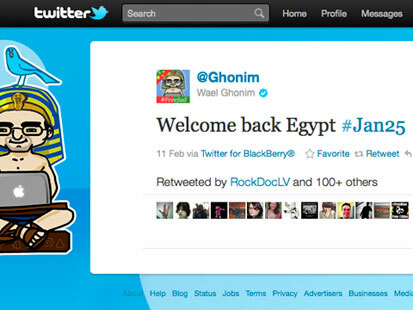 "Welcome back Egypt #Jan25" Wael Ghonim, a marketing manager at Google who became a symbol of the revolutionary movement, was held in captivity for nearly 12 days by the Egyptian government under Hosni Mubarak for organizing protests. When Ghonim was released, he told an Egyptian network to not focus the cameras on him. "I'm not a hero. The real heroes are the youth who are behind this revolution. By God's will, we're going to clean this country of this rubbish," he said. "I think the most important lesson there was that you give people simple tools and they will use them in good ways." said Doresy. 2. "Helicopter hovering above Abbottabad at 1AM (is a rare event)." A local man in Abbottabad, Pakistan unknowingly live-tweeted the raid on Osama bin Laden's compound before any news agency broke the story of the terrorist's death on May 1. 3. "my daughter her name is sarah m. rivera" Through Underheard in New York, an initiative to help homeless residents in New York City speak for themselves, Daniel Morales was able to use a prepaid cellphone to create a Twitter account and tweet, "my daughter her name is sarah m rivera." He posted his cellphone number and a photo of her at age 16. Morales was reunited with his 27-year-old daughter, Sarah Rivera, when she called him the next day. 4. "This lockout is really boring..anybody playing flag football in Okc..I need to run around or something!" "Twitter makes the world feel a lot smaller," said Dorsey, the co-founder of Twitter. That was definitely the case during the 2011 NBA lockout, when Oklahoma City Thunder player Kevin Durant tweeted, "This lockout is boring…anybody playing flag football in Okc…I need to run around or something!" A student at Oklahoma State saw the tweet and invited Durant to join him and his fraternity brothers in a game. A few hours later, Durant arrived, ready to play football with them at a local field. 5. 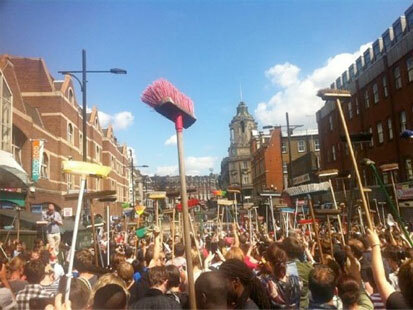 "Brooms up London!" After riots in the U.K. dirtied the streets this August, people rallied on Facebook and Twitter to organize a massive clean-up effort in the affected areas. An account on Twitter called @riotcleanup gained over 70,000 followers and brought together those who wanted to help. 6. "Here's another Photo of the shuttle from my plane." In May, NASA launched the space shuttle Endeavour. 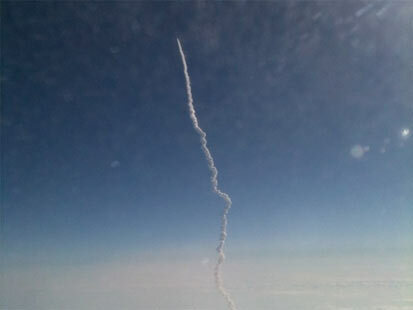 Stefanie Gordon, aka @stefmara, took a photograph of the launch from a plane and tweeted it, capturing the launch from a new perspective. 7. 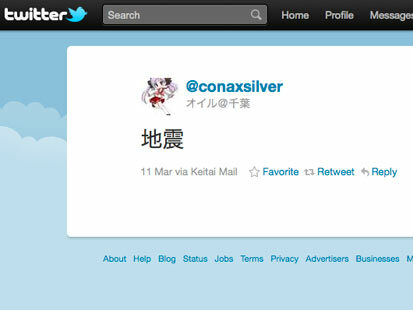 "Earthquake" On March 11, when an earthquake and tsunami hit Japan many people used social media sites to make sure friends and family were safe and to publicize emergency response information. "You want to feel like you're not alone in this massive, massive experience that is potentially very scary," said Twitter co-founder Jack Dorsey. "To me it's about being able to reach out instantly and know that others are with you and others are experiencing the same thing and others are out there supporting and that's what you saw in Japan. You saw people reach out and say we're in an earthquake right now and then all around the world you have all these replies coming in to these Japanese people saying we're watching…it's OK…are you there?" 8. "Subtitles are always so bad. England, America, Switzerland put one uv repeat Scrollingverfahren + = high quality!" Julia Probst, a lip reader and soccer fan, reads the lips of soccer players and coaches during matches and tweets them, providing fans with a running dialogue that they would otherwise not be privy to. Her efforts extend beyond soccer to raise awareness for deaf and disabled people in politics and media. "It's completely uncensored and you never get to see that unless you are on the playing field," said Dorsey. 9. "Ercis central mosque behind the apartment building..." After the earthquake in Van, Turkey, news anchor Okan Bayulgen sent relief and aftershock information via Twitter. One of his followers gave him an address where people might be trapped alive under the rubble. Bayulgen shared the address with a relief agency, and two hours later the agency rescued two people at the location. 10. "Hey @Mortons - can you meet me at the newark airport with a porthouse when I land in two hours? K, thanks. :)" On August 17, Twitter proved it could not only connect people, but also grant wishes. Peter Shankman tweeted: "Hey @Mortons - can you meet me at Newark airport with a porterhouse when I land in two hours? K, thanks. :)." When he landed at the airport, a tuxedo-clad Morton's waiter was waiting for him with a steak, shrimp, a side of potatoes, bread, two napkins and silverware.